The renowned Nasiyan Jain Temple is to be found at Prithviraj Marg in Ajmer, Rajasthan. After the temples of Ranakpur and Mount Abu, Nasiyan temple is regarded as one of the best Jain temples in Rajasthan. 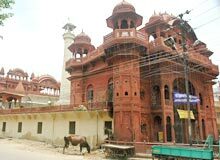 Built in 1865, Nasiyan Temple is also known as Lal Mandir (Red Temple). Centrally located in Ajmer, the temple can be reached easily from anywhere in Rajasthan. Nasiyan Digambar Jain Temple is dedicated to Lord Adinath, the first Jain 'tirthankara'.